Station Master Joseph Henry Clarke died on 30th March 1911. He was succeeded by Harry I'Anson, the Station Master at Bakewell. As a means of getting to know his staff, I'Anson recorded certain details about them in a large index book. This book was subsequently maintained by his successors until 1966, although it is clear that some events went unrecorded. Nevertheless, the information that was recorded gives an insight into the working of a medium-sized railway station. It covers both wars, with the associated employment, and dismissal, of female workers, and also illustrates that unlike today the main activity was associated with goods and mineral traffic. Some staff were in situ for a long time, while others only worked for a few days. A few of these found the jobs not to their liking, while there are cases of people being taken on, and then found to be unsuitable for medical reasons. Others were dismissed, although this may not have been for disciplinary reasons.There were periods where economies were clearly being made, whilst developments in the country as a whole led to some posts becoming obsolete, none more so than when horse cartage was replaced with motor vehicles, most draymen being unsuitable to train as motor drivers. Not all information in the book is included here - addresses in particular have been omitted. If you would like further information about specific individuals please contact Glynn Waite via the Study Centre Co-ordinator as detailed below. 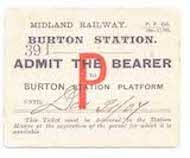 Dates of birth (DOB) were rarely checked in Midland Railway days and it did not become common practice to check birth certificates until the 1920s. Consequently, the Company generally accepted what individuals told them. Sometimes they gave a different age if they considered it would help them get employment; in other cases they did not know the actual detail. The book was also written initially in an "age last birthday" format, which was common practice in those days. Calculations on this basis sometimes lead to a one year difference in the age, especially where the month of the DOB and the date entered service (DES) were around the same time of the year. The Station Masters themselves are not included in this document. Their details are recorded separately.